It was that legendary Chicago film exhibitor Oscar Brotman who gave me one of my most useful lessons in the art of film-watching. "In ninety-nine films out of a hundred," Brotman told me, "if nothing has happened by the end of the first reel É nothing is going to happen." This rule, he said, had saved him countless hours over the years because he had walked out of movies after the first uneventful reel. I seem to remember arguing with him. There are some films, I said, in which nothing happens in the first reel because the director is trying to set up a universe of ennui and uneventfulness. Take a movie like Michelangelo Antonioni's “L’Avventura,” for example. "It closed in a week," Brotman said. "But, Oscar, it was voted one of the top ten greatest films of all time!" "They must have all seen it in the first week." (n.) Deformed, violent creature that lurks in horror movies, jumping out of basement shadows and decapitating screaming teenagers. 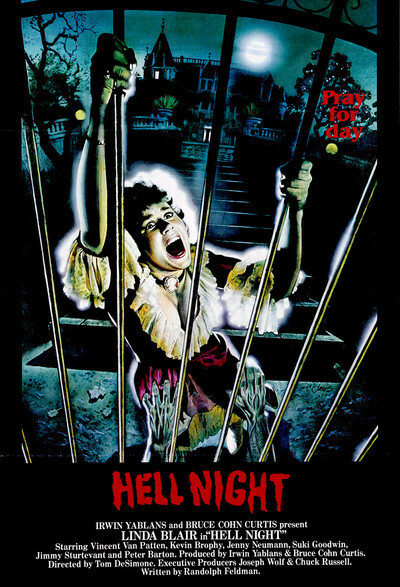 I have now of course, given away the plot of “Hell Night.” As the fraternity and sorority kids creep through passageways of the old house, their candle flames fluttering in the wind, Andrew the Gork picks them off, one by one, in scenes of bloody detail. Finally only Linda Blair is left. Why does she survive? Maybe because she's a battle-hardened veteran, having previously more or less lived through “The Exorcist,” “Exorcist II: The Heretic,” and “Born Innocent.” At least in those movies, something happened in the first reel.